Is seems no matter what events occur around the world, good or bad, Mother’s Day appears to come around the same time every year. Actually, I welcome the day as it gives me the opportunity to let Patty know how much I appreciate all she has done over the years for myself and our two wonderful children. And what better way to thank someone than through food. Our day started out fairly normal as I made the coffee, my everyday task, and cooked up a simple omelet. This was a simple egg omelet with sautéed peppers, onions, cheddar cheese and a zippy ghost pepper salt my son gave me for Christmas. Patty appreciated this, but unknown to her I went on a secret mission the day before to a grocery and fish store (of all places), to shop for dinner ingredients. Luckily Patty decided to go to yoga and I feigned laziness (which raised no suspicions) and gave me time to prepare an evening meal. I started with some all natural wild rice. For you novices like me, this is easy to do if you follow the simple instructions on the package. The trick is to know that it is not like the “instant” white rice in that it takes about an hour to cook. For me this worked fine as I knew this ahead of time and I am painfully slow in the kitchen. 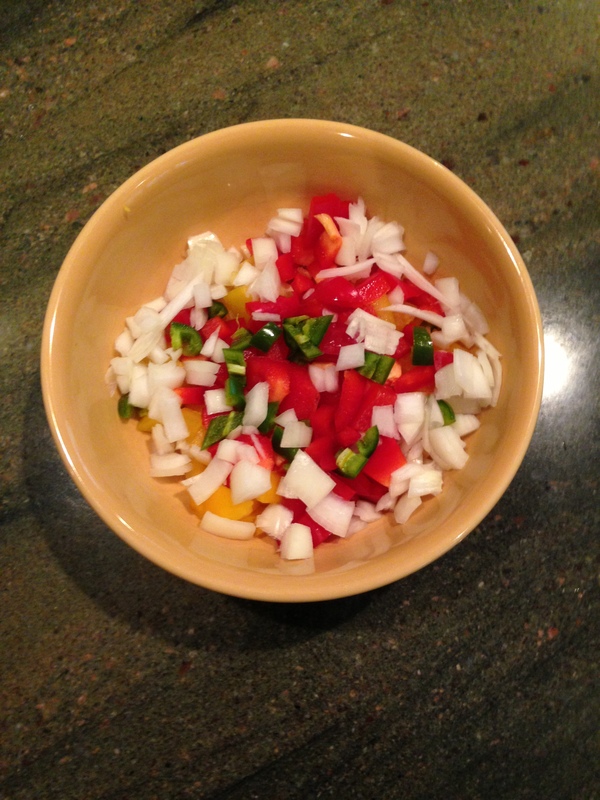 Rice on, I moved to the salsa. I must admit I was nervous about this combination but was determined to forge ahead with something new. 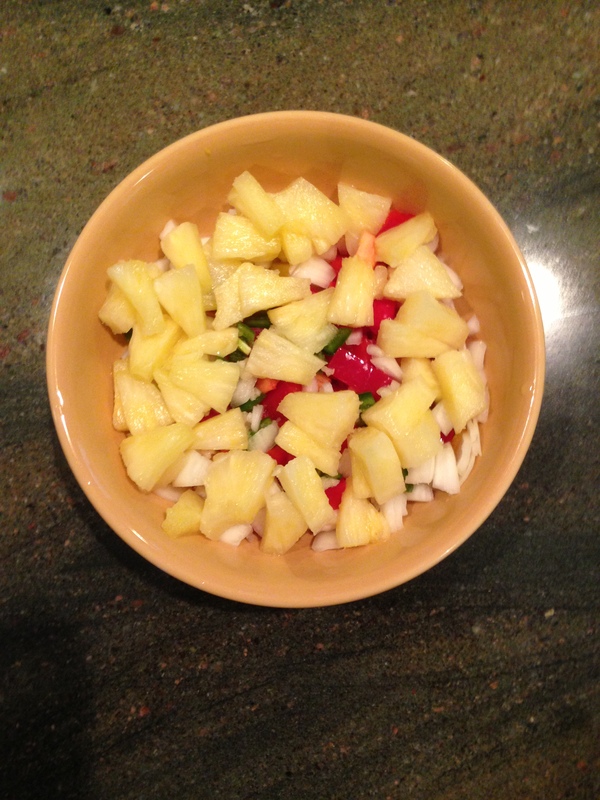 To make the salsa, I diced red pepper, yellow pepper, onion, a small jalapeño pepper, diced pineapple with a bit of its juice and minced garlic. These flavors turned out great; however, next time I will dice the ingredients smaller and add a bit more pineapple juice. 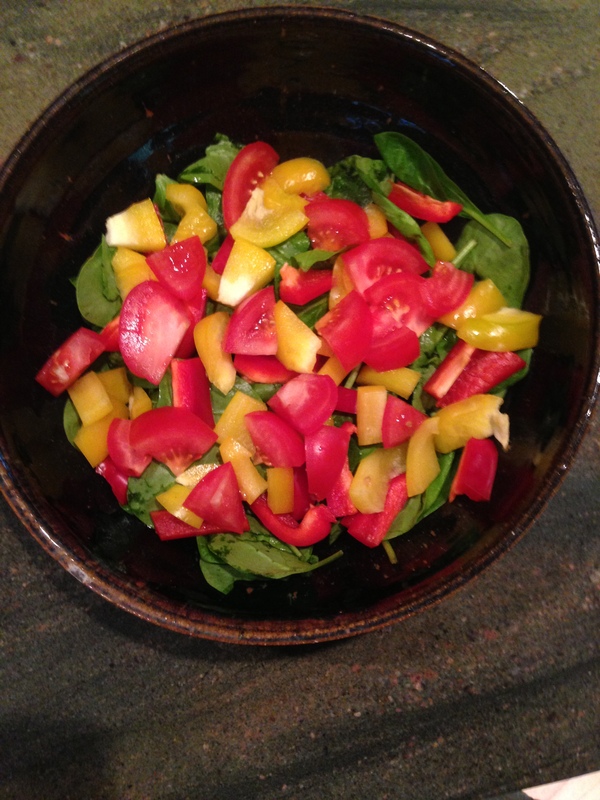 I then made a simple spinach salad with red and yellow peppers and tomato. This was served with a ginger dressing, but any favorite would work and feel free to add avocado (which I had and forgot) or any other yummy extras. I usually add more or less depending on what is in the refrigerator or garden. Around this time Patty came home and was slightly shocked to smell cooking. It was so foreign in our house to have me cook even the cats had not come into the kitchen to beg for supper as they do when Patty cooks. It was then time to fire up the grill (which I love to do even if I am grilling vegetables) and get to cooking the salmon. I had selected some good salmon from a fish store which looked a bit pale as it was not injected with the typical dyes, (yes they do that) and flavored with lemon only as I knew the salsa would be added. I garnished this with lime and after the 7 to 10 minutes it took to cook, Patty was ready to eat at the pre-set table. 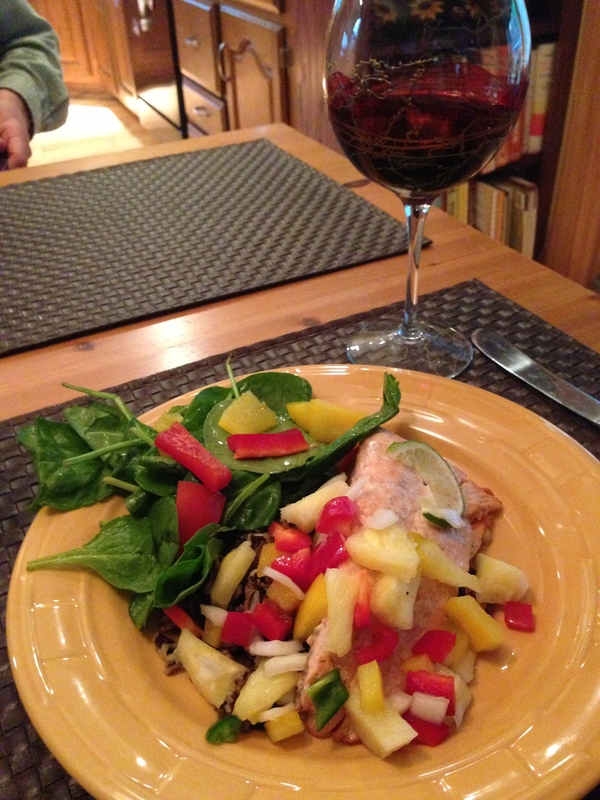 The final meal was plated with the rice first covered by the salmon and salsa and the salad on the side. 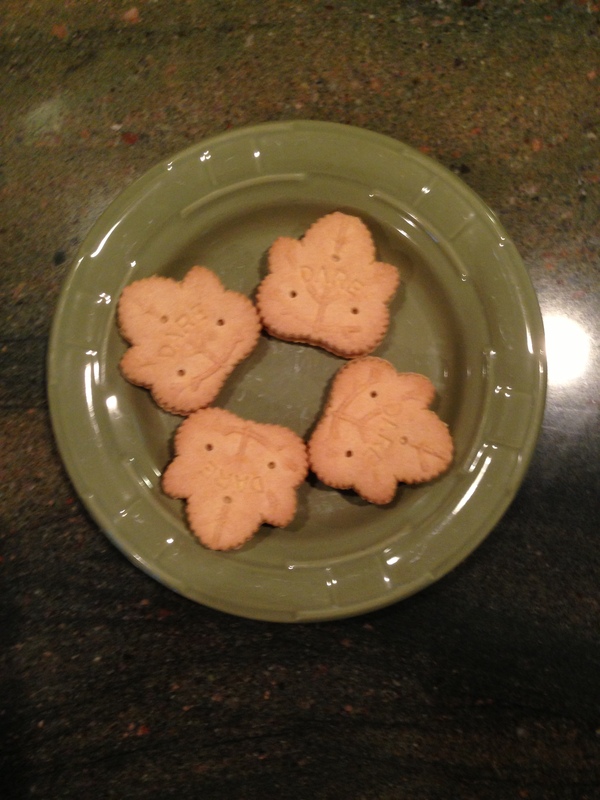 As we are not big desert eaters, I picked up some very basic cookies for desert to keep it simple and avoid spoiling leftovers. The secret to make this special was all in the plating and the candlelight setting. To conclude the day I put the leftovers and dishes away and then took out the calendar to start the countdown for next year.